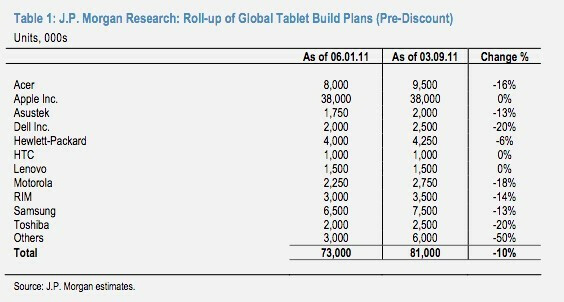 iPad rivals are cutting down on build plans, says a research note from J.P. Morgan's analyst Mark Moskowitz. Manufacturers' production plans for Android and other tablets in the January-March period, have been cut with 10% on average. While the number might not seem significant, the sheer fact that manufacturers xpect the tablet market to shrink beyond their sales predictions is pretty telling. To put things in perspective, however, we must note that Apple also sold quite a bit less iPads than analysts expected in its latest quarter, but supply issues due to the Japanese earthquake were deemed the culprit. So was the case with the Asus Eee Pad Transformer, though. The analyst provides the following table with production plans details, from which it becomes clear that only Apple, HTC and Lenovo haven't reduced their sales estimates from January to March. Of course, most tablets were hardly available at that time, so a snapshot of the same plans taken in the end of June would be more appropriate. 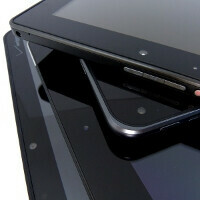 Nevertheless, Mr Moskowitz claims that tablet manufacturers are having an "early dose of reality", slashing production plans, but at the same time he expects tablets to hijack a significant amount of market from desktop and notebook computers in 2011, enough for a spillover effect, and real shift in the industry. So the guy is hedging his bets, but it's actually too early to tell how the tablet market will develop. Seeing how Asus can't make enough of the Eee Pad Transformer, BlackBerry PlayBook is selling better than expected, while the Samsung Galaxy Tab 10.1 is not even available yet, not to mention the iPad 2, it's pretty obvious that the tablet game of chess is with a yet-unknown outcome.